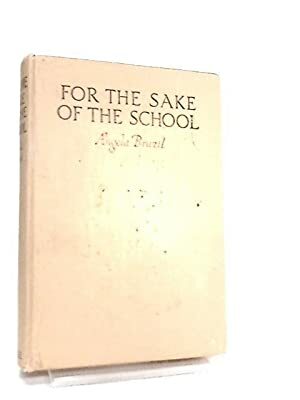 This entry was posted in Books and tagged Angela Brazil, boarding school book, For the Sake of the School, girl's story, school story by Katrina. Bookmark the permalink. Have just skirmished through this thanks to Gutenberg: what a delightful story! I enjoy the old books like this for their wide-ranging references – bits of French, Latin, literature, nature-lore, the old songs (“Caller Herrin” and “A May Morning”) – and the things that were very current at the time – the mention of Louvain, and the trenches. I always enjoy reading things that add to my general knowledge. Well although you skirmished through it you must have read it closely. I think she judged really well the amount of war related mentions in this book. I imagine it was read by girls who must have had relatives at the front and possibly had even already lost brothers there, but at the same time they would want to escape from the war by reading something like this book. An old friend of mine said she never read novels because they were just full of lies! However I find myself often learning things through novels. To put something “by” the dresser means to put something *beside* the dresser in the part of Scotland (Moray and Banffshire) where my wife and I grew up as your contemporaries. However to put something “by” without a specific location did mean to put it away somewhere unspecified. Same here really and things were often ‘put by’ for the future or for safe keeping. This children’s book has “me” written all over it. I’m so glad it’s on Project Gutenberg. Will definitely check this out right away. We have the absolute worst!! humidity we’ve ever had here. Hot, too, of course. I’m a puddle, but I guess I wish I were a poodle. I miss having a dog in the house. Will remedy this in the coming months. I was thinking that you would be hoping to get another dog soon. I hope it turns out to be as lovely as Sasha was. One night last week our temperature wasn’t far off freezing, but today was a lovely sunny day although much cooler than it has been.